Once the Euro was launched in January 1999 , the Eurosystem had as a primary objective, the establishment of an European securities market. When the Eurosystem was founded in 1998, the objectives were, as a first step, the establishment of a financial stability and then to set up an integrated European securities market. For those purposes, the TARGET projects were launched. 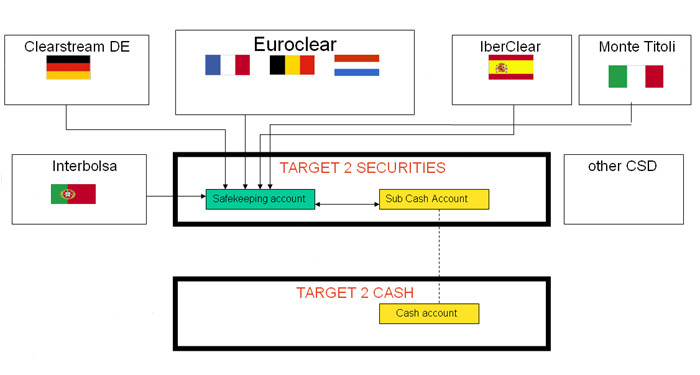 TARGET (1999): the interlinking of the Eurosystem adherents' real time gross interbank cash settlement systems. 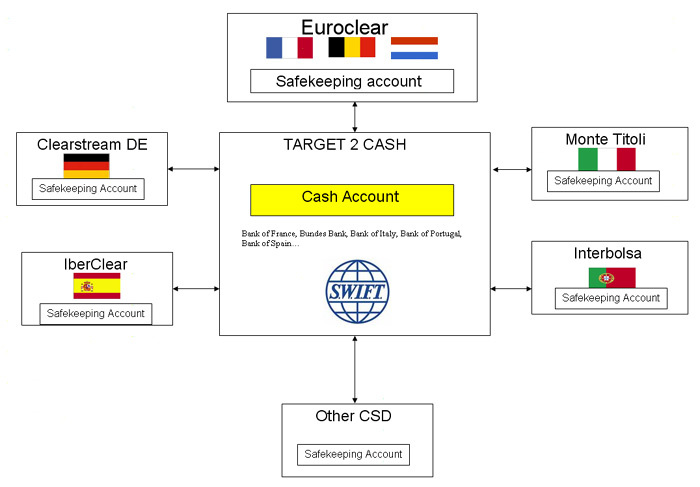 TARGET 2 CASH (2007): the implementation of a single shared platform for cash settlement within the Eurosystem. TARGET 2 SECURITIES: will allow its participants to share a common platform for securities settlement. The Eurosystem is an entity made of the European Central Bank, ECB, and the 15 central banks of each European union member that accepted the Euro as their currency . The Eurosystem is the authoritative entity in term of monetary policies. It is forming a part of the ESCB (The European system of Central Banks) which encompasses the ECB as well as every European countries' central banks. Unless every European country accept the Euro as currency, there will always be a distinction between the Eurosystem and the ESCB. There is in Europe, a large number of very different settlement systems. Each European member owns one that is generally managed by its own central bank. The here after table draws the list of the main European cash settlement systems. NB : They are all based on a RTGS system ( Real Time Gross Settlement ). The Eurosystem had to build a real-time "core" system that was to solve every newly rising problematic following the launch of the Euro such as, to guarantee & secure interbank transfers & cash settlement in order to reduce transaction costs. In 1999, TARGET became the first cash settlement infrastructure, doing better than FEDWIRE (The American cash infrastructure), with daily volumes that often exceed € 2000 billions. Following this success, the Eurosystem participants & management started to think about what would be TARGET's next evolution, through a Survey in December 2002. The results of this Survey (2003) highlighted the need for technical and services harmonisation & improvement, with an eye to resolve liquidity management problems submitted by banks having offices in several European countries. The hereunder architecture allows participants to own a single virtual cash account, bringing together their overall transactions. Achieving such a system led to the creation of the SEPA (Single Euro payments area), which enabled price-reducing between every participants whatever their location. From that point, there is no more distinction between domestic and cross border operations. The last migration slot occurred on MAY 19th ( Italy , Greece , Denmark , Estonia , Poland. ). Target 2 CASH is a great leap towards the Eurosystem's integration objective; through the accomplishment of the previously launched projects, the ECB came to think about having a settlement engine on a TARGET 2 CASH based architecture, so as to finally complete of the European settlement infrastructure. The Target 2 SECURITIES (T2S) is just being discussed between participants and the ECB. If voted, it would be based on the TARGET 2 single shared platform and would allow participants to settle any security transaction in Euro and central bank currency. At the beginning of each business day, a participating CSD would transfer its securities account position to T2S. During the course of the day, various settlement operations will be performed directly on the T2S platform. Transactions will be technically settled on the platform, but would legally be opened on the CSD books. At the end of every business day, a reconciliation between T2S and the related CSD will take place.